It’s Friday Fictioneers time! Ably hosted by Rochelle, a hundred or so flash fiction writers submit a story of roughly a hundred words. This week’s photo was provided by Jan Wayne Fields. This one led to a huge blank until my mind wandered down a path I rather wish it hadn’t. After much thought I’ve decided to publish it anyway. To view the other stories for this week click on Bracken, the little blue chap below. More stories are added through the week so be sure to check back! The bureau desk had seen heavy use over the decades. Polished countless times by loving hands, its oak finish still gleamed in the light filtering through the bedroom blinds. Fathers had balanced the bills at that desk. Mothers had written poems and children had penned journals. 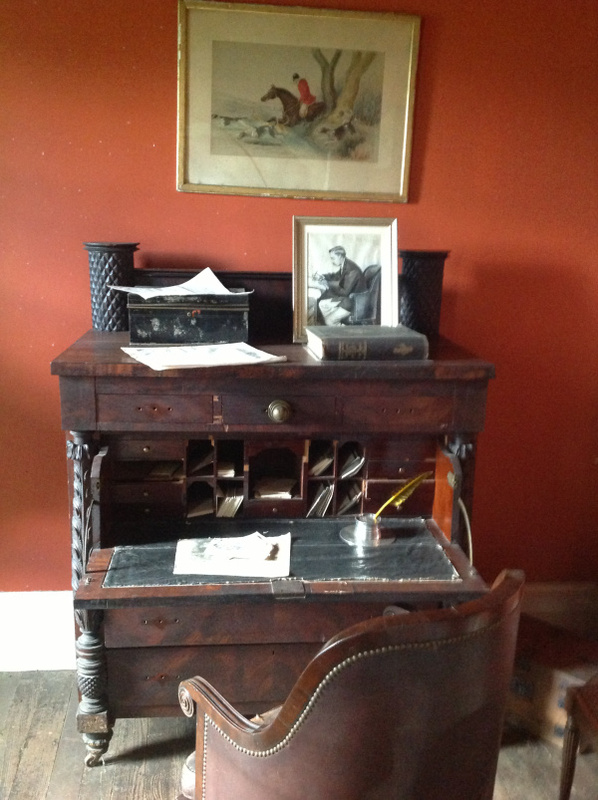 Down through the generations the bureau had been treated with love and care, a permanent fixture of the old house. Now the varnish reflected blue flashing lights, the blood dribbling down the carved sides a grisly new addition, courtesy of a messy custody battle. If he couldn’t have the kids, the husband had figured, no-one could. Keep that blood and gore coming! Yes! Wow. I don’t know what to say to this one…it is well written in how it sets the scene, so that makes it a good story. I think maybe a comedy next week. Quite horrific. I’ve never understood why people could think that way. You conveyed this well, especially with the historical aspect as a contrast. Well done. great blog and detailed – enjoying reading it! I certainly didn’t see that twist coming. Unfortunately it’s too realistic for comfort. Well done. I actually hovered over the publish button for quite a while before clicking, it’s a bit too realistic for me too. Yes, and sadly it happens. a beautiful legacy turned ugly. i’m stomped for words. A sad end to the generations of that family indeed. Thanks. I came close to not publishing, it was a bit too real for me. Maybe a comedy next week! i don’t get how or why people can do these things. Very disturbing. Very disturbed people, I guess. Oh my goodness! Such horror framed in such peace. It happens and we wonder and say we can’t imagine. But you have, doc. I wish I hadn’t imagined. Maybe I’ll try to lighten it up for next week. Oh, wow, your story took a sharp turn into darkness. So sad, because I’ve seen so much of this in the news lately. It breaks my heart. Well done! It is awful that every now and then this story appears in the news. Yes, I can see why you hesitated to publish. Your story is good, lacks for nothing except a kind hearted hero. Remember the creepy fence story you wrote? I came across a similar fence today while hiking and was creeped out. Shame on you, 10 lashes. wow absolutely haunting… and i love that you showed the contrast between the earlier days and the present which, sad to admit, is so messed up… i hope more people would value love and family. Thanks, my aim was to get a good contrast between the love in days gone by and the sudden violence of the present in that house. Aaaaa! You were worried about my writing desk! What about the children. My goodness. I read your title last and then my heart broke. It’s a very sad story, and I had many second thoughts before I published it. Hopefully the next photo will speak to me in a comedy way. and to think you were going to let this story sit out this week…oh, thankfully not. love the list of historical uses through the years. definitely can see the latest event taking place with all the ugly divorces these days. sad story but well written. Thanks. Yes, we see this sort of thing in the news (thankfully only occasionally but even once is too often). That’s why I nearly didn’t publish. I won’t be revisiting this topic, I think, it’s horrible and freaks me out. I had trouble hitting the like button because this rings so true. We will never know what goes through the minds of men and women who kill their kids, just always know it is wrong. Very well written. I had trouble hitting the publish button for the same reason.